While soccer is considered a non-contact sport, it is still a highly competitive sport where players are still susceptible to certain injuries. Knees are one of the most vulnerable joints to the demands of soccer and moderate to severe knee injuries occur frequently among soccer players. These range from cumulative injuries from overuse of the joint, such as practicing a certain kick again and again, to acute injuries which occur where there is a violent force or sudden impact. Cumulative injuries can often be healed or at least managed with rest, care and proper support, but acute injuries will often require surgery followed by a term of rehabilitation or other post surgical care. Whether you are suffering from cumulative or acute injuries, protecting your knee is of utmost importance on the soccer field. To help you keep this valuable joint safe and protected on the field, there are a number of different knee braces available, depending on the type of support you need. 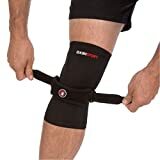 Knee braces range from simple compression fit sleeves that help the knee recover from minor or cumulative injuries to full braces with metal hinged brackets to protect the knee and provide additional support after major injury and/ or surgery. Once the knee has been injured, it’s particularly important to provide additional support and protection to keep it from being reinsured. What can be fixed once cannot always be fixed twice. Here are a list of some of the top knee braces for 2017. The DashSport Compression Knee System – The DashSport Compression Knee System is a two-fold design that offers both a premium patella knee brace to provide maximum support AND premium quality compression sleeve to provide maximum relief. The system is fully adjustable with an adjustable patellar band that offers targeted compression on the areas that require the most attention. The Copper Nylon Compression Knee Sleeve is designed to offer relief of sore muscles, increase blood flow, and provide general support as well as offering all the benefits of copper. It is odor resistant, anti-bacterial and anti-microbial, with a wide gel pad and strong fasteners. Knee Brace Support by Winzone – Winzone’s open patella knee protector allows you to run and kick without pain and instability. It offers a high level of support in a soft, flexible brace that still allows for maximum movement and has a high degree of adjustability to accommodate knee circumferences from 12.4″ – 21.7″. This wide degree of flexibility allows you to use the brace by itself, or add additional layers of support and protection beneath the brace if necessary. It is easy to use and is guaranteed to stay on tight so you won’t lose valuable focus in a tight game by issues with your knee brace. 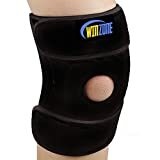 The Winzone open patella knee protector is a mid-range item. Shock Doctor Ultra Knee Supporter with Black Bilateral Hinges – Shock Doctor‘s Ultra Knee Supporter comes with bilateral support hinges which provide the highest level of stability and protection while still offering maximum performance. The supporter is made of N-Tex air flow vented neoprene which provides moisture wicking compression and creates therapeutic warmth which contributes greatly to fast healing. Shock Doctor’s Ultra Knee Supporter comes in S, M, L, XL, XXL and 3XL, so be sure and measure your knee before ordering. A tight fit is important for maximum support, and the brace will take a few days to break in and allow the fabric to stretch and conform to your knee. Braces in this range vary from the mid to the higher range. 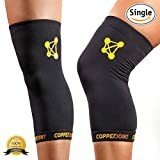 CopperJoint Copper Knee Brace – CopperJoint Copper Knee Brace promotes muscle and joint recovery by relieving muscle stiffness and offers rejuvenating relief from pain and discomfort, allowing you to achieve peak performance on the field. The brace includes a double silicone anti-slip system which ensures your sleeve will always stay put no matter how much movement you engage in. Active copper is a highly efficient agent in eliminating odors and the CopperJoint brace is made of 88% top quality copper infused nylon. The breathable, high performance fabric helps maintain optimal joint temperature and is ergonomically designed for a full range of motion while providing superior comfort and mobility without irritation and chafing. Bracoo’s brace design offers an open patella area to relieve pressure. The open patella area also helps reduce knee joint fatigue from intense exercises and heavy usage. The brace also includes a patella stabilizer which helps hold the patella in proper position and provides additional stabilization for the PCL, ACL, MCL and LCL ligaments. The brace is designed to help guide the knee cap into proper motions which helped to effectively receive sprains, strains and post-surgery knee pain. The brace comes in one size and fits 12.5″ – 18″ knee circumference. The three velcro belts that hold the brace in place are fully adjustable to accommodate the different needs of the user. When choosing a knee brace there are a number of factors to consider. The first is whether the brace is to be used for general relief of pains and strains, to prevent injury or to guard and protect against further injury after surgery. In addition, your level of play is also a factor. For serious athletes that regularly risk injury, a higher level of support may be required than for a person who merely plays in a recreation league. Simple compression sleeves offer relief from general discomfort and are often worn by elite athletes in basketball, baseball and all other sports but they don’t provide a high degree of stability and support. For relief from more serious injury, a more sturdy and stable brace is optimal and for additional support after surgery, a brace with a bilateral hinge support will provide the most protection against further injury. Price is also a factor to consider. The more frequently you play, the greater the investment you might consider making in high functioning support.